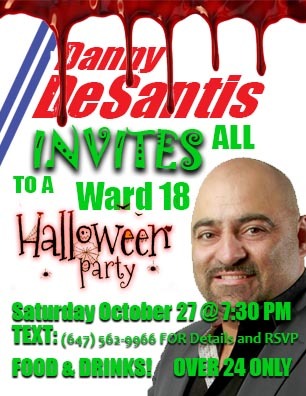 Danny DeSantis continued his public involvement with Willowdale by sponsoring a Halloween Party and inviting the whole of Willowdale. The evening was full of live music and costumes. The festivities began at 7:30 and went on well into the night. Many local celebrities attended and the usual band of suspects had a spectacular time with many Willowdale residents also attending. “I am looking forward to doing more of these and getting to know the people of Willowdale better” said DeSantis reflecting on the successful gathering. City Councillor Candidate Danny DeSantis debates incumbent John Filion in Willowdale. Should voters in Ward 18 trust Toronto election polls?